A coalition of good-government groups, social justice organizations, affordable housing advocates and teachers unions held press conferences across the state this week announcing they had submitted signatures for a measure that would significantly increase property taxes on California businesses and generates tens of billions in revenue for local and state governments. If it qualifies for the 2020 ballot—which it likely will—it would mark the first time in decades that voters would have a chance to change a key provision in Proposition 13, the landmark 1978 ballot measure that placed stringent caps on California property taxes, making them some of the lowest in the country for both residential and commercial property. What Would This Initiative Actually do? California treats commercial and residential property almost identically when it comes to taxes. In most cases, Prop. 13 allows properties to be reassessed for tax purposes only when they are sold to a new buyer. That means that a homeowner and the Target down the street (assuming Target owns that land) pay taxes on the value of the property when they acquired it, not at its current market value. That’s a huge discount for both homeowners and businesses, especially those who bought property a long time ago in a pricey area. This initiative would treat California commercial property different than residential property, a concept in the Prop. 13 wonk world known as “split roll.” Under the proposal, businesses would have their properties reassessed to market values every three years or less. Nothing would change for residential properties—the most untouchable part of Prop. 13. Commercial properties would still be taxed at 1 percent of their value. Who’s Behind It, and What Do They Want? 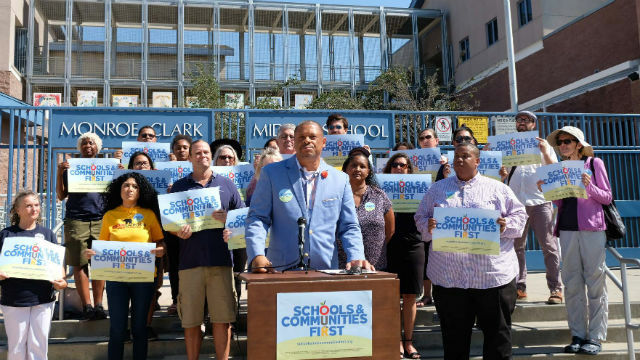 Backers include good-government groups like the League of Women Voters, social justice groups like the Alliance of Californians for Community Empowerment and some prominent state and local teachers’ unions. Big money has come from Bay Area philanthropic organizations such as the San Francisco Foundation and the Chan-Zuckerberg Initiative (yes, that Zuckerberg). The California Teachers’ Association, one of the most powerful labor unions in the state, has not endorsed the initiative. More than anything else, proponents want the revenue that would be generated from “split roll.” Prop. 13 has long been criticized for starving local governments by denying them a steady revenue source. Proponents estimate that altering this part of Prop. 13 would provide $11.4 billion annually for state and local governments, with about $4.5 billion going to schools. Who Opposes It, and Why? The California business community writ large, including organizations like the California Chamber of Commerce and anti-tax groups like the Howard Jarvis Taxpayers Association. They argue that at best, increased property taxes would simply be passed on to consumers, and at worst, businesses would reduce employment or shut their doors entirely and flee to other states. The cost of doing business in California is already high—this would make it even more difficult to squeeze a profit. This Won’t Be on The Ballot for 2 Years—Why Should I Care Now? Because even though you may not be voting on this until 2020, the political repercussions start now. Changing Prop. 13 is still an uphill fight—one that dissuaded advocates from their initial plan to place the initiative on this fall’s ballot. But the pro-split roll camp can proudly boast that they collected 800,000 signatures, and received a big bankroll to do so. A recent USC Dornsife/Los Angeles Times poll found that 54 percent of Californians said they would support the measure. The core of Prop. 13—property tax initiatives for homeowners—is obviously a much tougher fight than targeting commercial properties. The prospect of split roll on the 2020 ballot could also induce legislative action at the Capitol. Leading gubernatorial candidate Gavin Newsom has voiced lukewarm support for the concept, but has repeatedly stated that Prop. 13 reform should be part of a “broader conversation on tax reform in the state.” With both legislators and special interests eager to avoid a costly battle at the ballot box, the initiative could spur action for a broader compromise well before voters get a chance to weigh in.